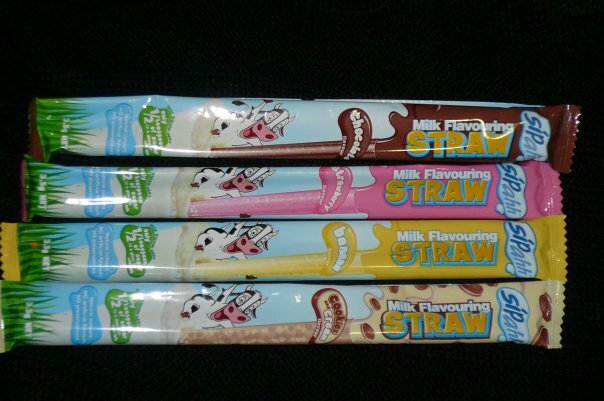 I was absolutely thrilled to have recently found these straws which spice up any glass of milk. Do you have difficulty getting your kids to drink soy or rice milk? This may be a bit of help you could use. They are GLUTEN-FREE. After reading the ingredients, they also appear to be dairy-free, egg-free, and nut-free; everything we avoid. They also appear to be soy-free which opens up the opportunity for an entire additional group of allergy kids to enjoy! 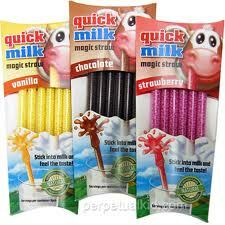 Quick Milk Magic Straw, distributed by Magic Straws, LLC, Bloomington, Minnesota. Ingredients include: SUGAR, GLUCOSE SYRUP, COCOA POWDER, DEXTROSE, FLAVOR, SWEETENER,SUCRALOSE. I know the 'flavor' additive may worry some. I have a call in with the company and will follow up with information as soon as I hear back. Their website states they are: gluten-free, lactose-free, all natural (no artificial flavors, colors or preservatives) AND that they safe for people with corn, nut and soy allergies. With all of that information in print, I decided to gives these straws a try! I decided to give them a try and my kids proceeded two drink two glasses of soy milk. Quite a feat for my oldest whom I struggle with getting enough calcium in. She prefers I dress her soy milk up in smoothies, milk shakes or hidden in foods I cook. I couldn't believe the variety of flavors they have! Wild Berry, Orange Cream, Banana, and Chocolate Candy Cane just to name a few! Would you believe they even have ON THE GO SINGLE SERVE STRAW PORTIONS!! These are great for throwing into lunches. It's something different and fun for my kids to share with their friends as they all sit around the lunch table. Thanks to our local Rosauers grocery store for having a few on sale!! I stocked up to be ready for any occasion! !